Now we have the turned pen the next job is to sand it and put a finish on it. Because the pen will be used frequently it has to feel nice as well as look good. So as with most turning the sanding and finishing is a very, if not the most, important part of making it so take your time and get it right. Micro-mesh can be brought in lots of places and is now available in double sided sponge pads as can be seen in the picture above. 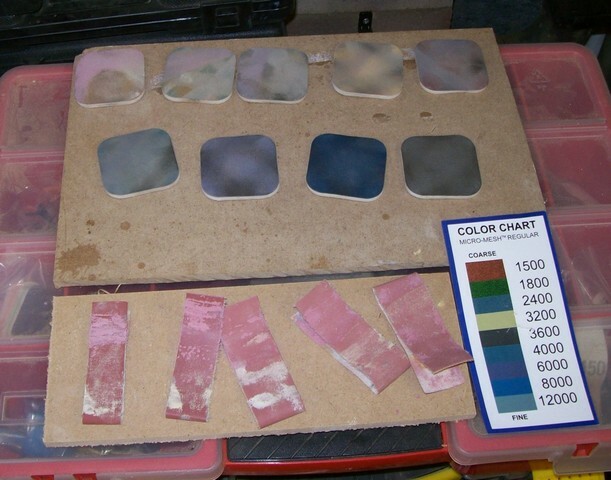 The pads can be washed after use and when clean are all different colours as can be seen by the chart. So we start of with the pen after turning. I usually sand at about 800 rpm or lower. Start with whichever grade you think will get rid of any tool marks and unevenness and continue with that grade until you are happy that the pen is smooth and free of any marks other than sanding marks. If the grade you have chosen isn’t getting rid of the marks use a coarser grade and remember don’t put pressure on the sandpaper to try and get it to work better as all you will do is heat the wood and the sandpaper up which could result in the wood cracking. Some parts of the wood will be very thin so only light pressure must be applied. Between each grade clean the wood either with a piece of paper towel or my favourite brush it with a paint brush. This is to get rid of all the dust and any grit left behind by the previous grade of sandpaper. The idea now is to go down through the grits polishing the wood by removing the marks from the previous grade until the pen is smooth and shinny as below. The picture above shows the pen after sanding down to 12000 with miro-mesh, there is no finish or anything else applied the shine is coming from the wood itself. You are now ready to put a finish on, this can be anything you want, friction polish, sanding sealer and wax etc. my favourite finish for pens is BLO/CA and I have explained how I do it in a separate section HERE.